Celebrating the opening of two bridges along the D&H Rail Trail on Aug. 7 were (top, from left) Rail-Trail Council board president Bob Breuche, EMHR executive director Annette Schultz, Susquehanna County Commissioner Alan Hall, State Rep. Sandra Major, Rail Trail Council executive director Lynn Conrad, Susquehanna County Commissioner MaryAnn Warren, DCNR Eastern Regional manager Lorne Possinger, and Natalie Geib of the Lackawanna Valley Heritage Authority. 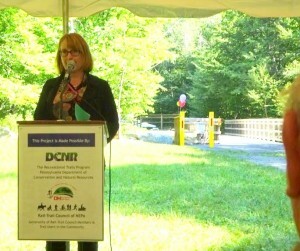 Schultz (above) offered remarks about the importance of partner agencies such as the Rail-Trail Council and the Authority working together to accomplish each element of the project such as the trail access point over her left shoulder. Numerous leaders of heritage and conservation-based entities gathered with politicians and other project supporters on Aug. 7 in Susquehanna County for a ribbon cutting ceremony and celebration of the opening of two new bridges on a 70-mile hiking and biking trail that will ultimately reach as far as Philadelphia along the former D&H and O&W Railroad lines. The bridges near Forest City are the sixth and seventh bridges to be redecked with concrete, and will grant access for recreationists to 10 additional miles of a 26-mile rail right-of-way from the New York state line to Simpson purchased 25 years ago. Bids will go out shortly for another seven miles, with construction anticipated to begin in Spring 2016. The trail loosely parallels the northern headwaters of the Lackawanna River that were not tainted by mining. The area is in fact popular with anglers for whom the river is stocked each spring with trout. Each new segment of trail that opens provides more access for fishermen, wild-life enthusiasts, and budding horticulturalists. Future plans also include the constructions of switchbacks in the Starrucca Ravine and recognizable integrated signage that will help users engage with the heritage elements of the trail, including railroad and mining history. The overall project has been at least 25 years in the making. Clearing this most recent hurdle was made possible by matching grants form DCNR and the Recreation Trails Program, as well as a help from dignitaries like Sen. Lisa Baker and Rep. Sandra Major, who assisted the Rail-Trail Committee in acquiring the land and working with DCNR and project planners. 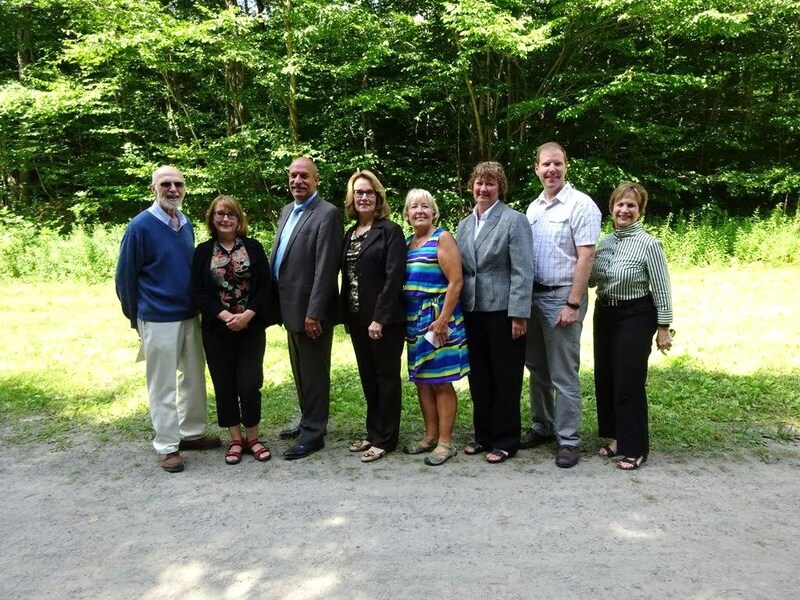 The Rail-Trail Council holds more miles of former railroad lines than any organization in the country, and Susquehanna County Commissioners Alan Hall and MaryAnn Warren were among those who expressed their gratitude for having such a great new recreational attraction in their county. For more information about the D&H Rail Trail, including maps, access point details, rules, and even the locations of varying species of trees, log on to www.nepa-rail-trails.org.